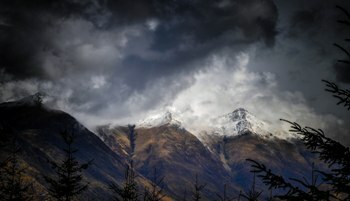 The magnificent Mountains of Glen Shiel, sweeping Southeast from Loch Duich, delivers some of the best walking routes in the Scottish Highlands. Rising spectacularly to over 3000ft in just a few miles the Mountains are exposed to some of the worst West Highlands Notoriously unforgiving Scottish weather, please do not underestimate the following two hiking routes, they can look fairly easy walks looking at a map but many people have been unfortunate tackling these walks due to failing to estimate nightfall and being trapped in unexpected weather, the weather on these mountains can change without warning and take even the experienced walker by surprise. Always be prepared following these routes or take an experienced guide with you. Taking in a number of Munros, the five sisters traverse probably the most popular route in this area, set yourself a full day to walk in this area that starts at the first fire break that will be on the left hand side as you head soutwest down the A87, start straight from here and follow the ridge Northwards along to Scurr na Moraich 2874 feet, declining down the opposite side to Morvich on the valley basement. The easy recognisable chain of Mountains across the glen from the famous Five Sisters is the Kintail Ridge crossed by another well known route that starts at the Cluanie Inn on the A87, Directly starting from here you follow the rather well worn path southwards along the base of the mountain until its joins up with a stalkers trail which heads up steeply up Creag a’ Mhaim 3108 feet and then head West Along the ridge, with stunning views South across Knoydart and the Hebridean Sea. Many other areas of Glen Shiel and its spectacular mountains can also give excellent walking, whilst further down the Glen is the village of Dornie with the forever famous Eilean Donan Castle. Also close by are the waterfalls of Glomach probably the most dramatic waterfalls in the United Kingdom, or if you prefer to drive for the best views, take the road through the Mam Ratagan Pass that leads you to Glenelg.